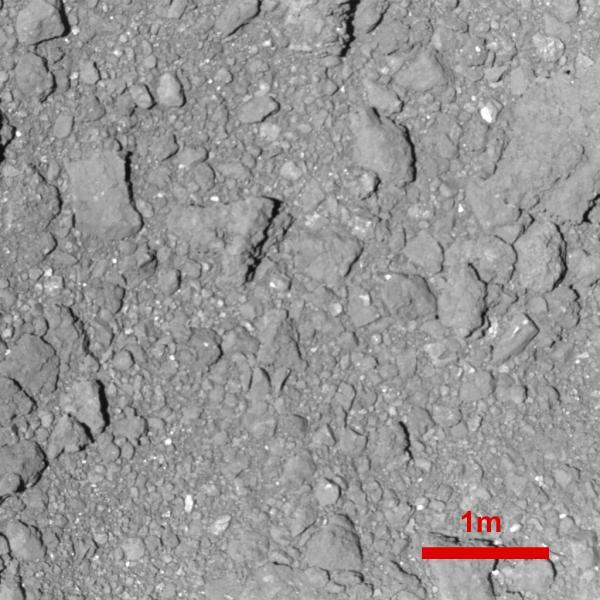 This image of asteroid Ryugu was taken with Hayabusa2’s ONC-T (Optical Navigation Camera-Telescopic) on October 15, 2018 from an altitude of 42 meters. The resolution is about 4.6millimeters per pixel, and this is the highest resolution that Hayabusa2 spacecraft has taken. This is the highest resolution image that a spacecraft has taken of an asteroid. Image Credit: JAXA, Tokyo University, Kochi University, Rikkyo University, Nagoya University, Chiba Institute of Technology, Meiji Univeristy, Aizu University, and AIST. Japan Aerospace Exploration Agency’s (JAXA’s) Hayabusa-2 mission is on track to return samples from its target asteroid, 162173 Ryugu, a C-type Near Earth Asteroid (NEA). The past month has seen the successful deployment of two rovers and a lander. The mission focus is now on the successful retrieval and return of a surface sample. Domingue and Le Corre participated in a press conference during the 50th annual meeting of the American Astronomical Society’s Division for Planetary Sciences (DPS) in Knoxville, Tennessee. The DPS press conference brought the community up to date on the activities of the mission and the preparation for sample retrieval. The press conference panel consisted of several Hayabusa2 team members, including Masaki Fujimoto, the head of ISAS/JAXA, Hikaru Yabuta, the lead of the landing site selection committee and the multi-scale regolith characterization team, Ralf Jaumann, the lead for the European Space Agency’s (ESA’s) MASCOT lander, and Eri Tatsumi, the ONC team instrument scientist.